Apple is as always mysterious about their products and also events, but not this time. They have officially announce iCloud as their main attention on the next their annual Worldwide Developer Conference (WDC) that will be held June 6-10 in San Francisco Moscone West. The tickets has been sold out (as usual). Two more days and we will shortly land on June, halfway to another new year, the year of 2012. I simply can't believe that we almost spent half a year since early this year and since then, there were a lot of things had happened, both good and bad things. Time flows very fast, sometimes we don't even think about it. We aged every day, every minute, and every second. But something we have to value is our life. We are given a chance to life a wonderful life with all the people around us. Take a look on your neighbour and you will find a lot of people. We are gifted with so many technologies around us. We have lived in a digital era where all seems so easy and so much fun. Unfortunately, in this digital world, sometimes we are trapped inside the virtual world and neglect the environment around us. We forgot about our family, friends, colleagues, and also closest person in our heart. I had this video on Youtube from one of Indonesian Slackware Community about Disconnect to Connect. It's an ad from DTAC Thailand TVC, but it reminds us about our real life. We shouldn't be focusing on our mobile phones all the time, but do remember that we have other people around us. It's a great ads and i'm sure you will love the ads. It's May and it's exam time. My students got their computer security exam this morning and they have done their part. Now, it's my time to do my part, which is marking. Less than a month after Ubuntu 11.04 is released, LinuxMint 11.04 "Katya" which based on Ubuntu 11.04 is now officially released. Clem, the main lead of LinuxMint has posted the announcement, including the download link. More information about this release can be seen at the Release Notes. After spending three days and two night at Surabaya, finally i'm home now. I had a great days in Surabaya along with my colleagues and also my business partner. I met a lot of people, gain new knowledge and also got a lot of new ideas for future work. Today's schedule was a bit tight. We all had breakfast at the hotel around 8 AM and then we left to ITS a little bit early since it was quite far from our hotel. When we reached at ITS, we split into two groups, since me and Restyandito attended the ACAD CERT meeting while Bajuaji went to Secure Coding workshop instructed by two representative from JP-Cert. The workshop ended around 5 PM, while my meeting ended around 11.30 AM, so we left ITS without Bajuaji and went to pick up another business partner and have lunch and chit chat at Tunjungan Plaza 4. We spent some time in Tunjungan Plaza until around 4 PM and then we split up, because we had to leave to the airport. Since the airport is far from TP, we left at around 4:15 PM, even though the flight was scheduled at 7 PM. We didn't want to take a risk. We arrived at the airport around 5 PM, which was 2 hours ahead of schedule. There we met our friends from AVNet. They were also going back to Jakarta today, but their flight was earlier than us. Before we departed, we had dinner together and then our flight departed around 7:15 PM and we landed in Jogja one hour later. I slept during the flight since i didn't get enough sleep yesterday. I slept at 3:30 AM this morning and i only had 2,5 hours of sleep since yesterday. in the Fedora software repository. backups when using this filesystem (backups are a good idea anyway!). list and improve their typing speed and accuracy. a much higher success rate than local retracing. improvements and profiles updates for better efficiency. from the Mozilla non-profit foundation is part of this release. HTML5 technologies and a completely revised user interface. learning platform developed by the non-profit Sugar Labs foundation. all the relevant packages have been rebuilt in Fedora 15 using it. language, REAL*16 support in Fortran and many other improvements. the target for breakpoints in gdb. 3.0.5: Rails 3 is a large update to the Ruby on Rails web framework. activemailer and activerecord APIs, and many more new enhancements. session manager for Linux, compatible with SysV and LSB init scripts. model these rules are lost if the firewall gets modified or restarted. restore the configuration in a service restart and reload case. Another use case for the dynamic firewall mode is printer discovery. creates appliances from simple plain text appliance definition files. that expose network port naming information in SMBIOS 2.6 or later. potential vulnerabilities in these applications. Today i had a busy schedule. I left the hotel in the morning at 8 AM because i had to had breakfast and then i went to Novotel Hotel using a cab to attend the Information Security Seminar and Workshop along with my colleagues. I arrived at the hotel around 8:30 AM. The event was a bit delayed and it was started around 9:30 AM. The first session was from miss Tintin Hadijanto country representative for EC-Council, followed by Mr. Misaki Kubo, representative from JP Cert, a lecturer from ITS (I forgot his name and there was no information on the website as well), and lastly was Mr. Salahudin vice president from ID-SIRTII representing Eko Indrajit who couldn't attend this event. After the seminar, we had lunch at the swimming pool side and have a chat with some colleagues from SGU. I had a lot of inspiration after the discussion which could be implemented in our campus. After the seminar, actually i had no intention to continue with the drill test of incident handling, but me and my colleague decided to go with it since the other colleague were interested on it. In fact, it was an interesting session, but the fun was kinda distracted with a slow server that was being used to distribute the material and lab hands on. After the last session, we had a dinner at Tunjungan Plaza 4 with our friends from AVNET. We had dinner at Hachi Hachi and also ate Ice Cream . We went back to our hotel around 9:30 PM and had a chat before some of us went to bed and i write this blog post. Well, tomorrow will be my last day. Let's hope the meeting will go smooth and we will get the benefit of the meeting. Today is my first day in Surabaya. Actually, this is my first time going to Surabaya using plane. Usually i took a train to get there. Since it's office duty, i decided to take a plane. I left at 3 PM (delayed a bit untill 3.20 PM) and i reached Surabaya one hour later at 4:25 PM. We took a cab to get to the hotel and check in. Next, we had shower and we were picked up by one of our alumni to have dinner together with the other alumni which already waited for us at DCost. There were about 8 people at today's event, but it was fun. Photos will be added later when i have returned home since i don't bring any cable to transfer the photos to the computer. There's nothing interesting at day 1, but i am really excited to see my friends and also other alumni that came to the event even though they were only notified via Facebook and also in short time. I really appreciate their time and efforts. Today, i'm leaving for Surabaya for three days. I'm attending ACAD CERT meeting along with an Information Security seminar in Novotel and ITS. As always, i'm trying to try my best to reply all your emails, but i can't give you any guarantee that i will reply it as fast as usual, since it depends on the Internet connection availability there. Since my room is about to be renovated, i have to move to another room for a while. Since i'm also leaving next week, that means i only have this week to move all my stuffs to the new room. One thing i considered important is the availability of Internet connection, since i can't work without having Internet connection. This afternoon, my mother cleaned up the new room and when i got home, i started by moving my computer to the new room. After all of them were moved and setup, i had to make another change again, and that was re-wiring the line to the modem. Since my room was in the back and the new room is in the front, i had to make a new line for the modem from the splitter device. Once the re-wiring was done, i can have my Internet connection back. In fact, i'm writing this post on the new room. Fedora 15 is now marked as GOLD release, meaning that it has been completed for development phase and ready for deployment to the public. The developers are now working to make the ISO and distribute them to public mirrors and make sure that they are ready to distribute the new release. They will publicly announce the availability next Tuesday, May 24. By that time, all public mirrors will have the ISOs and repository ready. This will be a great release of Fedora 15, even though i don't use it in my primary desktop/laptop. I use Fedora only in my old laptop since it's working great and i don't have any complaints at all with it. It supports all of my hardware completely Let's hope the same goes with Fedora 15. Linus has just announced the availability of the Final release of Linux Kernel 2.6.39. It was a bit delayed, but finally Linus decided to release it anyway. The reason for the delay was his hesitation since he's leaving for LinuxCon in Japan and these two weeks are one of the most interesting phase in Linux Kernel development: The Merge Window. It's been a while since i updated my Fedora on my old laptop. Today, there was someone who asked about configuring Fedora for UKDW Repository since he tried the method i wrote, but it didn't work, so i give it a try on my laptop which is running Fedora. In fact, i modified the information a little bit and it worked. Update (19 May 2011): Fedora repository in UKDW Server is now removed due to Fedora's mechanism on Repository usage. Not every public mirror can be used by users unless they have signed for an official repository and the public URL is added into their metalink file for the list of repositories. This is not the case for UKDW's Fedora repository, so i decided to delete the repository. I built a virtual server on top of VirtualBox last year with some hope that the students can take advantage of it if they need a LAMP server for a spesific subject related to web development. I didn't really think about it because at first, i only wanted to try the headless installation article that i saw on one of ID-Slackware's member blog post. The server was up and running up to now and it has been used on several course, including for final project as well. Since Slackware 13.37 has been released, i wanted to build another virtual server using the new Slackware 13.37, so this morning, i decided to make a new one. It's up and running now and it has almost the exact configuration as the first one, except that i make it more up to date for the applications and libraries installed on it.I also allocate more space on it, so that it could be occupied by more and more students project. One note about this new installation is that it's the first time i used XFS as the default filesystem for all of the partition (except for swap). I heard a lot of article and benchmarking said that XFS is a nice FS for server, so i wanted to try this one, so i used it as the default. For now, i can't see the results yet, as there are no projects or loads, but there will be soon enough. If you are curious about the server, you can take a look the spec here. After 26 days of being offline, finally Sony has restored it's PSN and Qriocity services on several countries, mostly in US and in Europe. They have also upgraded their firmware and forced users to change their passwords as one of their anticipation of being hacked again. For complete new features and changes on this release, please have a look on PerlDelta. shape Perl 5's future, please join us on the perl5-porters mailing list. The title went to Chelsea last year, but this year, the title was brought back to the champion, Manchester United following a draw against Blackburn Rovers, thanks to a penalty by Wayne Rooney after Javier Hernandez was brought down by Paul Robbinson. The trophy will be given at their last match next week in Old Trafford as FA didn't bring the trophy this week. It will be a pleasant party since all of the MU fans can celebrate the party at their home base, Old Trafford, one of the best stadium in England and probably in the world. Starting next semester, we are enrolling new curriculum for all of our students. As always, new curriculum means there will be some adjustment for the students, so for that reason, we held a socialization event this morning for each class. Since i was a supervisor for class 2010, i attended this morning and give some brief information about why it's neccessary for the changes and also how it will be applied. Luckily my class is a new class, so they were not affected much by the new system. I have some time this morning, so i decided to try the new BackTrack 5 on top of VirtualBox. The installation is pretty straightforward and it's less confusing than Ubuntu even though it uses the same base (Ubuntu 10.04 LTS). After i logged in to the desktop using the Live CD ISO (I picked the KDE version), there's only a single desktop shortcut, which is a shortcut to install BT 5 on hard drive. I had problems when installing Ubuntu, mostly when setting the timezone since it tries to connect to the time server and it usually not responding for some time before it become active again. This doesn't happen on BackTrack 5. The longest part is when the installer stopped at 99% saying "Almost finished copying files...". I think they are still doing background process and it tried to connect to the Internet. Once this is done, i should have BackTrack 5 installed. Amarok team has released a new version of Amarok: Amarok 2.4.1 "Resolution". This is a stable release, so it should be safe to upgrade to this version. New "Preview" feature for the Organize Collection dialog. Patch by Maximilian Güntner . String filtering in the albums applet. Ability to change text alignment in the lyrics applet. The podcast directory service is now based on incremental parsing of OPML without caching in the database. Plugins can now be optionally enabled in the config dialog. Script selector is moved from the menubar to the config dialog. Now all changes to Preset Formats in Organize Collection dialog get saved on close, doesn't matter If dialog was accepted or rejected. Added "Update Preset" button to Organize Collection dialog, which updates currently choosen scheme. Changed tokens syntax in FileNameLayoutDialog (TagGuesser, OrginizeCollection dialogs) now tokens wrapped in percent signs (%token% instead of %token). Use KDirWatch to watch changes to collection. Fixed detection of iPod devices. Fixed crash when the lyrics applet was removed and re-added while a track was playing and the user pressed "ESC". Fixed cached lyrics were not displayed if no lyrics script was running. Fixed lyrics changes in the TagDialog were not "synchronized" to the lyrics applet. Fixed tag dialog crash when sorting by genre and then changing tags. Prevent crash on exit when using Phonon-VLC. The developer of BackTrack Linux has high commitment on BackTrack Linux 5 release schedule. They released it on time according to the schedule described on their roadmap. This version is built based on Ubuntu Lucid LTS (10.04). It uses a different kernel though. They are using the latest Linux Kernel 2.6.38, patched with all relevant wireless injection patches. Fully open source and GPL compliant. You can start downloading it now, but it's only available on Torrents only (for now). Perhaps they don't want to have their system gets banged by huge amount of request since this Linux distribution is highly anticipated by many users. The latest -Stable kernel has been raised again after Greg released a new version : 2.6.38.6. This is a maintenance update, so no new feature are included, only bug fixes and minor changes. Even though Greg urges users to upgrade to this version, it's wiser to look at the ChangeLog to decide whether you really need to upgrade to this version or not. Manchester United has just won a big match against Chelsea 2-1 in Old Trafford. It's the same score when Chelsea beat MU at their home, but the situation is different. It was a crutial time in the race for the title as this season only has 2 matches left and both of them are the best candidate for the champion after Arsenal was down 3-1 to Stoke C.
It was Javier Hernandez who scored the first goal under 1 minute and then followed by Nemanja Vidic to get United's second goal. 2-0 lead stays remain until half time. Lampard scored a surprising goal with his left foot, but that couldn't help Chelsea to get more goals out of United's net until the end of the second half. It's a bit disappointing that Rooney didn't get more goals since he got so many chances, but eventually it was blocked by Alex and denied by other Chelsea players. I can't wait to see United win the champion title next week and then they can start focusing on Champion league against Barcelona in Wembley Stadium. iOS 4.3.3 has been out for some time and it's ready to be jailbreaked after some developers has released an update for their products which can be used to jailbreak the latest iOS released by Apple. iPad 2 is very popular around the globe, even in China where most of the electronic products can be faked there. 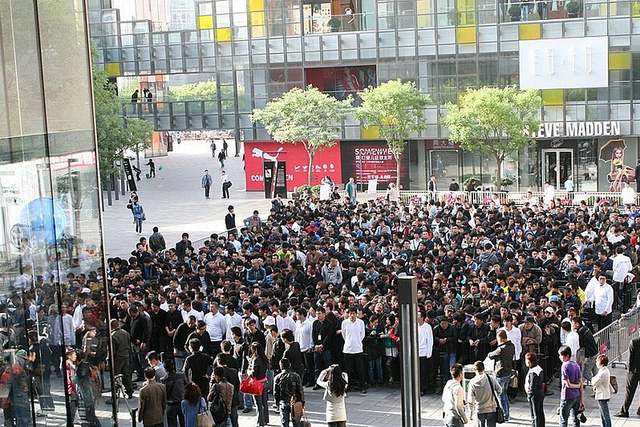 Yesterday, Apple officially released iPad 2 in China and guess what? It was sold out in just 4 hours. As you can see, iPad 2 demands were very high in China and also around the globe. The third series of KDE monthly update is now available at public KDE mirrors. This update is a maintenance updates, meaning no new feature introduced and only focusing on bug fixes and translation updates. The 4.6.3 release is dedicated in memory of the young daughter of KDE developer Daniel Nicoletti who tragically passed away after a car crash last month. The ChangeLog is not really interesting, but for those who needs a stable update, this version might be the right choice for you, since it's safe to upgrade to this version. One of the most well-known Linux distribution for penetration testing: BackTrack Linux is under heavy testing and it's being prepared to be launched in the next five days. It will be based on Ubuntu 10.04 LTS edition and it will have (finally) support for 32/64 bit architecture. It will have a version number of 5 and codename of "Revolution" and what's more interesting is that it will support KDE 4, Gnome and Fluxbox Desktop Environment (DE) and they will also release ISO for each DE, so users can choose as they like. The previous version only comes with KDE 3. The menu structure will be reorganized so that it doesn't have any difference no matter what DE you used. It will also come with a full source code in the repository just like what you can get in Ubuntu Linux repositories. As usual, it will be equipped with an extensive list of penetration testing tools which is selected carefully to ensure that it stays up to date and proven to be useful for penetration testing session, both in real live or in simulation (for example in CEH classroom session). I'm not really sure if they will come in VMWare Image or not, but looking at the past releases, i'm sure they will release it in VMWare as well. They playes perfectly even though only three senior players were played by Sir Alex Fergusson in order to make the rest of the squad fresh when they meet with Chelsea this weekend for the title race of EPL. The EPL title might be decided by this battle and it's so crusial so that Sir Alex had to rotate the players cleverly and he did it perfectly. Even though Ubuntu 11.04 has just been released few days ago, it doesn't mean that Ubuntu developer stopped working at the next release. In fact, they have started to work on Ubuntu 11.10 (Oneiric Ocelot). Their work can be seen by the availability of Oneiric repository at Ubuntu mirror site. For now, the repository is not yet completed, as it's just few days since the stable release, but some work has been available, for example the inclusion of Linux Kernel 2.6.39-rc5 and probably newer GCC 4.6 and many more. Remember that Ubuntu 11.10 is not yet suitable for daily usage. They haven't release Alpha version yet, so it's just a rough version, updated daily to improve the overal system of Ubuntu. Ubuntu 11.04 has been released the same day as Slackware 13.37 and it brings a major upgrade to Ubuntu system in general with the inclusion of Unity replacing the standard GNOME desktop. I was so curious about Unity which for some people caused so much headache and painful configuration in many areas and for the rest saying this is a worthed upgrade. Later on today, i will try installing Ubuntu 11.04 on a virtual machine (using Virtual Box) in my workstation (running Slackware 13.37) and see what will be my first impression about Ubuntu 11.04. So far, i'm pleased with Ubuntu 10.10 since it was so stable and well maintained. Let's see if this impression can continue in 11.04? (Update: 10:48 AM): I have installed Ubuntu on top of Virtual Box and sadly, it's like the others. It was kinda dissapointing. The installer stucked at time zone selection until i disabled my network adapter. It seems the installer were downloading something from Internet and it took all the resources. Some applications are not responding at first, but after i install Ubuntu 11.04 updates (there are around 49 MB of updates with just few days of updates, can you believe that? ), it works normally again. It's a sign of an untested applications before release. This is contrary to Slackware installation on my machine. Everything worked as intended. I guess i wouldn't recommend Ubuntu 11.04 for now. Stay with 10.10 for now and upgrade when 11.10 is released in the next five months if it's considered stable. Most likely Unity will become more mature and the base system will be much more stable than current version. HBO GO® is only accessible in the US. Minimum 3G connection is required for viewing on mobile devices. Some restrictions may apply for mobile devices. Last month, National Geographic magazine talked about world population that touched 7 billion people. It was huge amount and it could create so many problems if we don't think of a solution. The world is getting crowded and lots of things to take care, such as food, place to live, energy supply, and many more. This month, NGM showed a stunning number abou food for thought. In 2009, we have killed around 52 billion chickens, 2,6 billions of ducks, 1.3 billions of pigs, 1.1 billions of rabbits, 633 millions of turkeys, 518 million of sheep, 398 millions of goats, 293 million of cows, 24 million of water buffalo, and 1.7 million of camels worldwide. Can you think of the growing number in recent and future years? It would be very huge with more and more people living in this tiny earth. One solution to preserve those animals and keeping it from extinction is to start a new habbit of being a vegetarian. You can start your new habbit by reading all information about vegetarian at PETA's Vegetarian Starter Kit. It would be a good idea if we can spread this good habbit in our own environment and let it spread like a parasit.